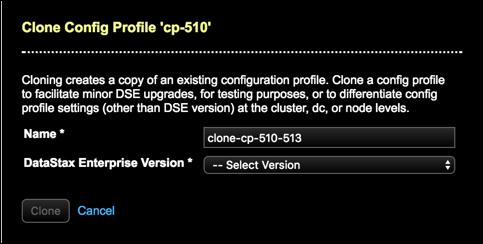 Clone a configuration profile as a starting point for similar but differentiated configurations, to use for testing purposes, or when upgrading DSE. Add a configuration profile that defines the configuration for DataStax Enterprise clusters. The configuration profile informs Lifecycle Manager which supported version of DataStax Enterprise to install, configure, and manage. Customize options for files that comprise an LCM configuration profile. Delete a configuration profile. Delete a configuration profile if it is obsolete or if you prefer a node or datacenter to inherit a configuration profile from its cluster. Cloning a configuration profile copies its settings to a newly named profile, optionally allows the selection of a new DataStax Enterprise (DSE) version, and provides feedback about defaults that have changed between the previous and the new DSE versions. Clone a configuration profile as a starting point for similar but different configurations to use for testing purposes, or when upgrading DSE. Cloning a configuration profile is a prerequisite to upgrading a datacenter or node to a higher patch version within a major release series. Click the clone icon for the configuration profile to clone. The Clone Config Profile dialog displays. A clone prefix is added to the profile name, but can be adjusted based on naming conventions, provided that the name is unique. This example uses clone-cp-510-513 as its configuration profile name. Select a DSE version from DataStax Enterprise Version menu. If performing an upgrade, select a higher version to clone. Only DSE versions equal to or above the version of the profile being cloned are available. This example clones a DSE version 5.0.5 config profile. Versions earlier than 5.0.5 do not appear in the version menu. Newly introduced settings for a DSE version: The cloned configuration profile inherits the default value for the new setting if not changed before saving the cloned profile. Updated default values for existing: The previous and new defaults are presented, in addition to any user-supplied value present in the source profile. If a user-supplied value was present and continues to be valid in the new DSE version, it is preserved in the cloned profile. If no user-supplied value was available, the cloned profile inherits the new default value. To modify default values, modify them during the cloning process or after saving the cloned profile. Deprecated settings removed from the cloned config profile because they are no longer valid: The previous field and its default value are displayed in the notification. Click each profile notification to review it in context within its file. Note: Some notifications cannot highlight and scroll to the field, such as when a field is not showing because its parent is field is not enabled. Select the corresponding enabled field to review its settings. Clicking on the … allocate tokens... field message highlights the field location with an informational message. Adjust any settings as appropriate for your environment. As with all configuration profiles, cloned configuration profiles can also be edited after cloning. Click Save to save the cloned configuration profile along with any modifications. Clicking Cancel deletes any modifications made to default settings, but does not cancel the cloning process. Edit or delete the cloned profile as needed. If upgrading the DSE version, associate the cloned configuration profile with the datacenter or node being upgraded and run an upgrade job. If the clone did not upgrade the DSE version and was for other purposes (such as development or testing), associate the cloned configuration profile with the cluster, datacenter, or node and run an install job or run a configuration job as appropriate.